The Rockefeller State Park Preserve is located in Sleepy Hollow, NY (Westchester County) on County Route 117 in (north of the Tappan Zee Bridge). Trail maps (with distance and grade descriptions) of all the carriage roads and equestrian permits are available at the Preserve Office. Click ‘read more’ below to see scan of trail map. 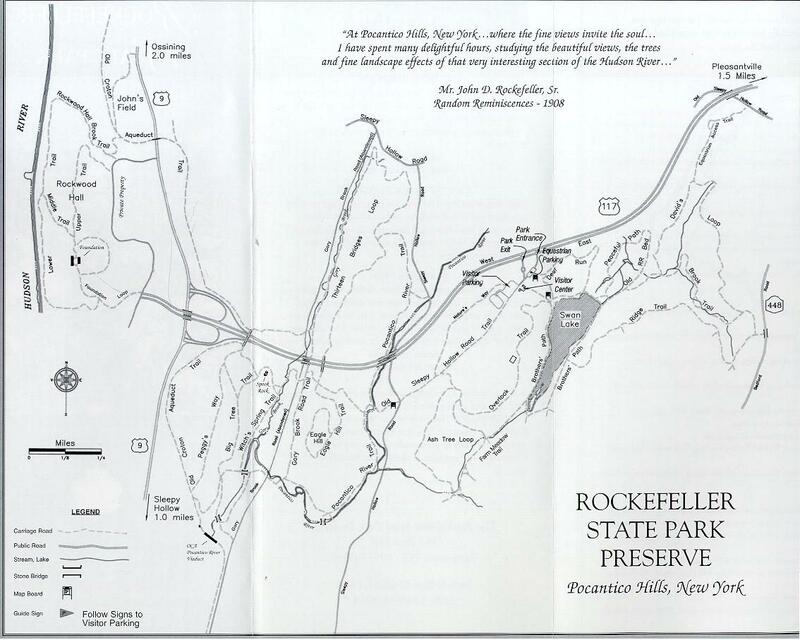 The Rockefeller Preserve land is comprised of a portion of the Rockefeller family estate in Pocantico Hills given to the New York State Office of Parks, Recreation and Historic Preservation in 1983. Since the Preserve’s inception, additional bequeaths have extended its size by 488 acres to today’s total of 1,233 acres. The most notable feature of the Preserve is the system of carriage roads built by John D. Rockefeller Sr. and John D. Rockefeller Jr. Designed to complement the landscape, the carriage roads, many of which are handicapped accessible, allow visitors to experience and enjoy the natural wonders of the area. These scenic paths wind through wetlands, woodlands, meadows, and fields and past streams, rivers, and lakes. They traverse wood and stone bridges, including the first triple arch bridge in America. If anyone has run in this park, please write about your experience in the comments below. Thanks!